After a hiatus, this creative and ever-evolving interactive landscape makes its 4th appearance in the Showcase… with a focus on How to Maintain your Drought Tolerant Garden. What to do with a huge sloping expanse of thirsty lawn? Break up the monotony and create an elevated bistro-style patio! 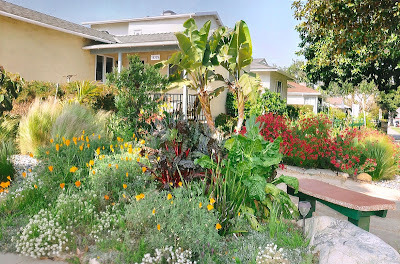 This garden features a friendly and inviting outdoor living space with "urbanite" terraces & meandering flagstone walkways, all done DIY and under strict budgetary parameters—everything cheap, recycled, or scavenged and free!—from homemade concrete planters to a park bench and fencing built from scrap lumber. For helpful DIY tips, read the event report and access the resource links from the garden owner's 2012 Showcase workshop D.I.Y. : Yes You Can! : Creative Lawn Conversions on a Budget. Come meet members of Transition Mar Vista/Venice and Transition Culver City, local chapters of the international Transition Towns movement. 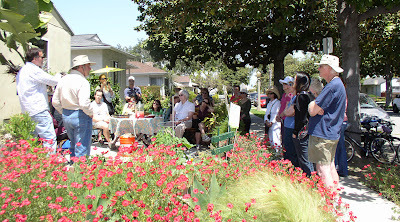 If you're not in a hurry to see the other showcase gardens, there's plenty of al fresco patio areas here to hang out and chat with like-minded people about community resilience, food security solutions, permaculture, alternative building, water harvesting, food forests, and much more. 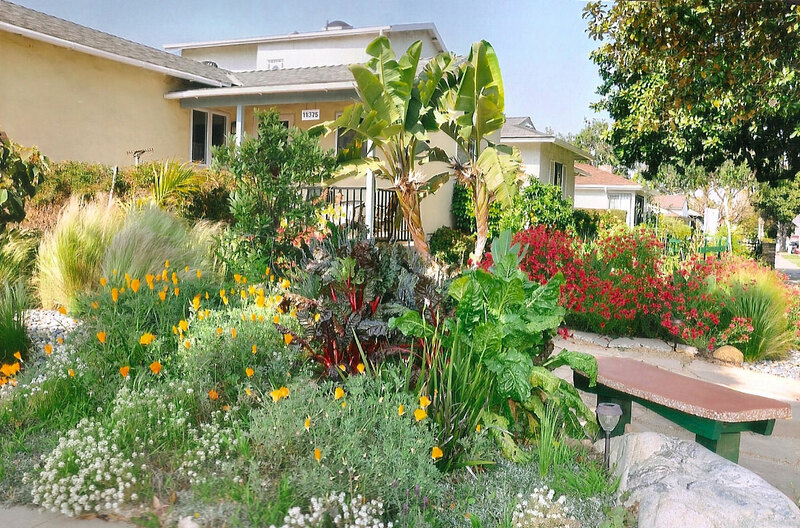 Transition Mar Vista will be providing helpful presentations on garden maintenance on the hour -- schedule to come! Rain Water harvesting system - a community project installed in one day! 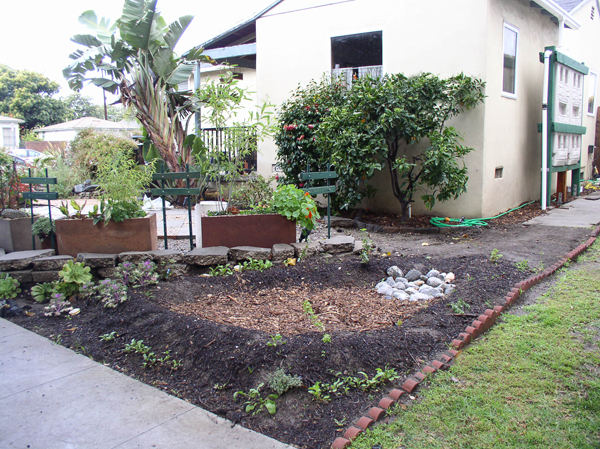 In 2012 the homeowners hosted a barn-raising-style Work Party to install their "hybrid" active and passive urban rainwater harvesting system. (SEE VIDEO HERE!) The volunteer crew created a passive diversion "reservoir" to help recharge the aquifer, helped install unique vertical tanks (an alternative to conventional rain barrels) for active catchment, and positioned a subsurface diverter pipe to feed the percolation area. California native currants (ribes family) and shade happy leafy greens were planted around the reservoir berm as the beginnings of an edible food forest. All this, in one day—a true demonstration of the power of community! Lower your carbon footprint! 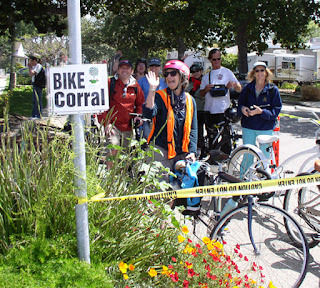 All visitors are invited to pedal over & park in a convenient "pop-up" bike corral specially created for the Mar Vista Green Garden Showcase by Transition Culver City and the Culver City Bicycle Coalition.